This preview has been provided by Raleigh Camerata. 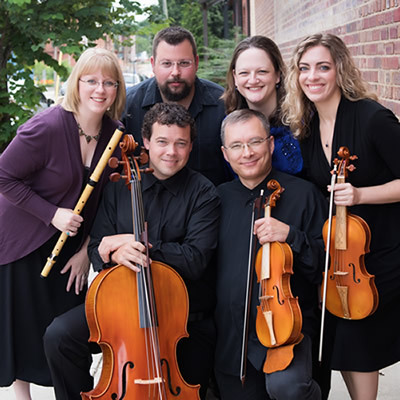 Noted for their "richly varied and engaging" performances by CVNC.org reviewer John Lambert, the Raleigh Camerata is readily making a name for itself in Early Music in North Carolina and beyond. The Camerata will present Concerto Night! a concert featuring three of their musicians accompanied by a small chamber orchestra on Saturday, February 10 at 7:30 pm as a part of the NC HIP Festival (Historically Informed Performance). Featuring Allison Willet on baroque violin, who is noted as playing "lovingly and with highest competence," Jennifer Streeter on harpsichord who is noted for her "considerable dexterity and musicianship" by Paul Williams on CVNCorg, and Kelly Nivison on traverso who Peter Jacobi of the Herald Times writes: "provides an exhibition of accomplished techniques: scales and tricks, trills and flutters..." and "treats [her music] with concern for tonal felicity and a desired sensation of ease." The concert will begin with Vivaldi's Concerto No. 11 in D Major La Stavaganza (The Extravagance) for Violin. This piece comes from a set of 12 concertos published in 1716 and was intended to be a vehicle for which both composers and performers could be commended for their stravaganze, their skill at containing the unexpected and bizarre within an established etiquette. The harmonic daring and bizarre passage work of these concertos noted by 18th century critiques are precisely the features that distinguish these concertos for the modern listener; they also demonstrate the care Vivaldi took over the selection and grouping of works designed for publication (despite his disclaimer that, under normal conditions, he could "compose a concerto in all its parts faster than a copyist could copy it".) In each of these twelve concertos he presents a carefully calculated solution to the problem of avoiding perfidia, the opposite of stravaganza, defined by Brossard in his Dictionnaire de musique of 1703 as "a predeliction to do always the same thing, to follow always the same scheme, to maintain the same rhythm". All three soloists, but particularly harpsichordist Jennifer Streeter, will be featured in J.S. Bach's Brandenburg Concerto No. 5. The 6 concertos are a collection of instrumental works presented by Bach to Christian Ludwig, Margrave of Brandenburg-Schwedt in 1721 (though probably composed earlier). They are widely regarded as some of the best orchestral compositions of the Baroque era. The Concerto No. 5 is believed to have been written in 1719 to show off a new harpsichord by Michael Mietke which Bach had brought back from Berlin for the Köthen court. It is also thought that Bach wrote it for a competition at Dresden with the French composer and organist Louis Marchand; in the central movement, Bach uses one of Marchand's themes. Marchand fled before the competition could take place, apparently scared off in the face of Bach's great reputation for virtuosity and improvisation. The concerto is well suited throughout to showing off the qualities of a fine harpsichord and the virtuosity of its player, but especially in the lengthy solo cadenza to the first movement. It seems almost certain that Bach, considered a great organ and harpsichord virtuoso, was the harpsichord soloist at the premiere. Scholars have seen in this work the origins of the solo keyboard concerto as it is the first example of a concerto with a solo keyboard part. The concert will conclude with C.P.E. Bach's famous Concerto in D minor for flute and orchestra, which is as much an orchestral work as it is a concerto. Like his father, Emanuel Bach was an inveterate recycler of his own music. This concerto started life as a keyboard concerto, and was transcribed either for C.P.E. Bach's employer Frederick the Great or, more likely given their technical demands, the virtuoso flautist Johann Quantz. Though less personal and outlandish than some of C.P.E. Bach's symphonies and solo keyboard works, the concerto still contains many of the composer's hallmarks: the furious drive and shock contrasts of the finale allegro di molto, for instance, or the characteristic Empfindsamkeit – 'heightened sensibility' – of the slow movement, with their sighing dissonances and brooding introspection. Bringing the work to an unexpectedly thrilling conclusion is the allegro di molto, music of remarkable speed and intensity. The flutist must not only be nimble, but must be able to hurtle down two and a half octaves in a single short passage, dodge exploding motifs in the orchestra, and hurl itself up several long scales. The sheer delirium of this music goes far beyond anything the composer's father ever attempted (although the style does have its roots in the flamboyant style of some Italian Baroque violinists); it looks ahead to the sturm und drang of Haydn's middle-period symphonies, and indeed some of the hurricanes unleashed by early Romanticism. Tickets: $20 general/$15 senior/$5 student/ 12 and under free.